Never had a hook break off a mile out, rollers on the other hand...not so much. I’ve broken both. If you’re large and/or generally sail hard, make sure you use a stainless spreader bar (hook or roller). Aluminum will eventually succumb to corrosion and fatigue. So can stainless if you get picked off hard enough while wave riding. 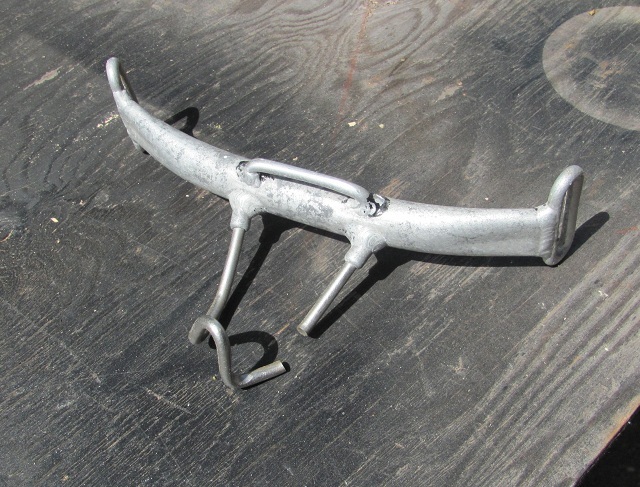 The aluminum spreader held, but the stainless hook broke, however it was several years old...………. but still, I was shocked, the crash also made my ears ring for about an hour. Still a dedicated sliding hook user. Isobars - thank you for such a comprehensive reply. It is really interesting, now I can get my head around what is going on, how different techniques and different equipment choices, achieve very similar objectives - its is entirely relevant to the OP original question. All of the actions you describe using the roller harness for I also do, but I unhook to do them. I only hook in when I am going in a straight line (which is why I couldn't understand sheeting out while hooked in). When I manoeuvre, I unhook and try to, literally, throw my body one way and the rig the other - I couldn't achieve the range of movement I would want while still hooked in. But I need this range of movement to get the transitions I want because, I guess, I'm not using pure grunt from the sail (in fact power from the sail becomes a liability). This is very physical and I definitely expend a lot of energy. But the end result of all of that is probably quite similar. Upwind, I slide my harness hook back, roll my front foot and often take my back foot out of the strap (that might just be me though) - all of which is so I can get as far forward, with the mast back, as possible all while hooked in - so again pretty similar. the 45 degree past dead downwind - I thought you meant you'd gone front to sail (as in a duck tack) but I get now; clew first, similar to an onshore wave sailing. so I guess, for the OP, a roller helps you to stay hooked in for longer, which saves energy when working the rig, but ultimately unhooking does give a greater range of movement. At the intermediate level tho, this is just another complication I cant imagine is worth worrying about yet. I have the standard hook and ONLY unhook to jibe, or tack. Just lake and sound sailing - no waves. Windsurfing for 34 years. Repeating myself: most harness manufacturers do not have a roller in their line up, and nobody uses a roller in PWA level competition. I cannot think of a worst system than a roller for controlling a boom position with precision. It is as if sailboats booms were allowed to move back and forth by themselves, instead of being tied down in their trim position. Sheeting out when going downwind? We are not on a sailboat. You sheet out significantly in displacement, not when doing 20-30 knots of speed. When planing your apparent wind does not change significantly with your direction, and it is the sail that adapts to the change. Unless you go deep downwind, eventually dropping off a plane, boom adjustments are minimal. Staying hooked longer? I only unhook when jibing or tacking (i.e. just before I fail a tack! ) and I never tire because of the harness!. When I manoeuvre, I unhook and try to, literally, throw my body one way and the rig the other - I couldn't achieve the range of movement I would want while still hooked in. But I need this range of movement to get the transitions I want because, I guess, I'm not using pure grunt from the sail (in fact power from the sail becomes a liability). While that’s a very common sailing style where I live (the Columbia River Gorge), it’s the opposite of my sailing style for two reasons: personal preference and impaired balance when the power is turned off. “They”, including you, prefer using gravity, while I prefer using power … two great ways to have fun. Except that I’m not willing to risk sailing any distance with my back foot out (see the any threads on ankle injuries and back foots). My harness line limits my forward stance a bit compared to your approach, but I’m still pinching higher than almost every other sailor on wave boards, so it’s good enough for me. Running big sails is a big part of that, and just one of 20 or so reasons I like to rig big. That’s because virtually all my sailing IS in onshore conditions … i.e., the wind and waves/swell moving in the same direction. But I don’t deliberately point much beyond dead downwind, as explained earlier. As long as you stick with riding the waves luffed and don’t mind expending energy unnecessarily, I fully agree. At some point, though, the skill of maneuvering while hooked in becomes much less a complication and much more a useful and fun addition to one’s skill quiver. Many sailors, including those who regularly sail in ocean surf often, have commented on what I can do hooked in. I work on it, and improve it a bit in almost every session. It converts work to pleasure and is a big factor in my long days on the water. If this were midsummer, my answer would have been, “Roller bars make everything much easier”. Alas, however, it’s winter, so DUCK! nobody uses a roller in PWA level competition. They have totally different objectives/priorities than people sailing for fun. Even if nothing else, they only have to finish their heat, not play at maximal level all day. Whether racing or wave sailing, competitive superiority is their ultimate -- usually ONLY -- priority, with hedonism and endurance unimportant. Therein lies a major difference between anything called a “boat” and an 8-foot, 80L,13-pound sinker with an articulated mast and a small sail. The former* is not amenable or responsive to the dynamic trim optimization so practical and beneficial with the latter (thus the patent on articulated-mast sailing craft.) Short of flapping the sail rapidly enough to disrupt wind flow (that takes a lot, since each “pixel” of wind spends less than 1/5th of a second traversing a WSing sail), fine tuning usually pays off. Minimal boom adjustments (plus using too small a sail) is WHY most people drop off a plane when blasting deep downwind (i.e., way below a broad reach, such as 70-100 degrees below a beam reach). Rigging bigger and learning to manipulate board and sail as required to stay fully powered when ripping downwind are mandatory in any wind I’ve ever sailed. To avoid getting slammed or simply vastly overpowered by ambient and/or apparent gusts when sailing downwind, options include oversheeting and sheeting way out (plus appropriate and aggressive footsteering as required). Choosing and linking those and other options involves a series of instantaneous and ultimately subconscious calls influenced by whether we’re hooked in and to WHAT we’re hooked. Because these and other control and safety measures may change within a second or two, doing them unhooked is exhausting and doing them in a solid hook is all but impossible for most earthlings. Power (roller) steering allows much longer sessions, but even then at some point we MUST unhook for safety or radical maneuvering. Sheeting in/out in response to gusts? It seems a misunderstanding of how modern sails work. Go back to the early 90s and yes you needed to sheet out when a gust hit. Use a modern sail and you do not, the sail does the job of spilling out the excess wind not you fidgeting with the boom. I agree, when talking about a fixated, mindless, laser-beam, suboptimal blast towards a real or imagined buoy. But ambient wind gusts are often caused by (or at least accompany) highly useful wind direction veers or in-yer-face backing that offer or even demand AOA and point of sail optimization. If one’s objective is gaining maximum ground when planing upwind or obtaining maximum burst boat speed for a jump, dynamic sheeting adjustments help when pinching upwind. And when ripping downwind (again, way beyond broad reaching) in too much wind to beam reach safely, “Sheeting in/out in response to gusts” becomes not just highly effective but mandatory. Even in a straight reach there are enough apparent and ambient wind speed and direction changes to benefit from dynamically tuning our rig’s angle of attack in response. Any place I’ve sailed (in 15+ states on fresh and salt water), the wind direction -- and with it the optimal point of sail -- often changes noticeably or even dramatically multiple times per minute. 5-20 degree shifts several times per reach are common in the Gorge with frontal or jetstream winds, and 90 to 180 degree shifts within minutes are common on some lakes such as the nearest one to my home in NM. The available wind power often roams over a 2:1 range (way too often a 5:1 or 10:1 range) a few times per minute in some conditions (e.g., shoreline or vertical mixing turbulence), and the terrain slope fluctuates with each bump. The opportunity to gain board speed and upwind or downwind ground -- even to resume planing out of a hole -- via rig and board angle of attack adjustments presents itself very often. Even for opportunistic drag racing, sudden directional changes can strongly affect the outcome. If you can gain the lead even momentarily, you can often keep it if every time your opponent begins to close the gap, you swerve away from him. His response lag will give you a tiny edge with each such change, and if you time your swerve to coincide with the leading/downwind face of even a small bump you gain a tiny edge from that bump. Those edges add up, especially if your roller bar allows you extra spontaneity his hook lacks. Here’s where and how a roller bar is virtually mandatory for me in all those scenarios. Each such change in rig angle of attack requires unloading a hook (via muscle power) sufficiently to let the line slip to the desired point. With a roller, however, full harness commitment can be maintained and energy conserved by letting the fingertips modulate the angle while the lines carry the horsepower … thus the dump truck/power steering analogy. A racer in a short heat can afford to waste that energy, but most WSers who want to play all day in such conditions can not. Even those who might try would try a 5.0, not a 7.5. Imagine a shoreline wind shadow full of very frequent square-edged turbulence (sometimes invisible because many gusts don't even hit the surface) with a gust to lull range of 30 to 5 mph (36:1 power ratio) for even 50, let alone 500 yards, to reach an outside blast zone suitable only for a sinker and a 3.5 ... a frequent scenario where I sail. It demands see-sawing the rig from sheeted in to sheeted fully out in a fraction of a second while trying to stand up to one's ankles ... deeper in deeper lulls. That's a full gym workout even with a roller bar, a nightmare with a freaking hook, and For Animals Only unhooked. It's often easier to just swim it. Everything I’ve read in many books on real world sailing technique, heard from many racerhedz face to face and online, and seen and experienced for decades tells me any WSing racer who doesn’t optimize his board and rig trim (as discussed elsewhere, this can be very subtle) for noticeable real-world changes in the wind vector and terrain is not maximizing board speed or ground gained as effectively as is the sailor who does optimize. Boats, with their greater mass, don’t have the luxury of fine tuning their rig and board vector in response to wind and terrain fluctuations as closely and dynamically as we do. Short of flapping the sail enough to interrupt wind flow (remember: each “pixel” of wind spends less than 1/5th of a second traversing a WSing sail), fine tuning pays off. Some turrist dood who can probably at least spell PWA once pronounced Gorge (and, by implication, just about any large and windy inland lake) WSing far more challenging than ocean sailing because the former is all just onshore crap. Maybe you’ve heard of him; his name is Josh Angulo. Staying hooked longer? I only unhook when jibing or tacking. Then you’re not maneuvering to your maximum potential during reaches. I can’t imagine laying the sail down into the trough, boom dragging the surface, when slashing, without unhooking, roller or no roller. Nor can I imagine ripping off a violent off-the-lip from an overpowered high pinch into a dead downwind run in a solid hook, considering the very sudden and extreme sheeting angle and power level changes involved. Yet it requires more skill than strength when hooked into a roller. I never tire because of the harness!. This implies that you don’t maneuver much during reaches (and suggests that you could go faster if you added AOA fine tuning to your toolbox). That’s fine if straight lines are your objective, but MANY of us are out there ONLY for maneuvering. We reach in straight lines only when we need to be somewhere else ASAP (e.g., approaching barge, darkness, or storm) and the wind is unusually steady. It’s all about personal preferences. Heck, some people’s only goal is to rack up miles, or attain a personal top speed, or hit a new altitude, or plane only long enough to pull off a trick. CHOICES! It adds hours of shred time on a good day of wind. I enjoy using using just my hips to slash rights and lefts on every bump at full speed while keeping the sail in its optimal AOA with the apparent wind. I.E., the sail is quietly mowing the lawn while the board is terrain-following the bumps as fast as I can link a series of rail-to-rail transitions. Or I may choose to add sail “English” to each transition to enhance it. Either can be done unhooked, but a roller bar cuts the manual labor by 95% and extends shred time very significantly. IMO, roller bars make everything much easier.